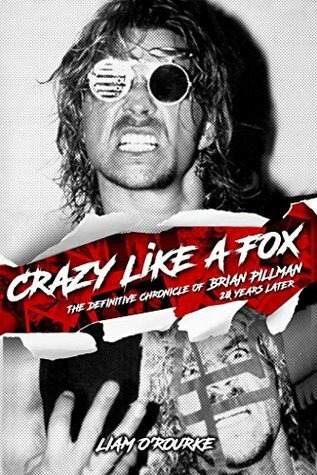 Crazy Like a Fox is the story of the career of Brian Pillman. Heralded as one of the greatest wrestler biographies ever written, author Liam O’Rourke takes you through the unique, albeit brief, career of Brian Pillman. Through his early days playing football in the NFL and CFL, to his final days as a performer with WWE, O’Rourke dives deep into the life of the ultra-talented, often under-appreciated, Flyin’ Brian. I can’t fathom a more comprehensive look at one wrestler’s career written by what is essentially an outsider to the business. O’Rourke leaves no stone unturned by conducting long-form interviews with men and women who played a large role in Brian’s life and career. Conversations with Dave Meltzer, Bruce Hart, Brian’s sister Linda, Jim Cornette and many of his peers helped to paint an intricate portrait of Brian now twenty-one years after he’s passed. Even though I’d describe myself as an information-sponge when it comes to wrestling lore, I felt like I had a harder time getting going with this book than a rusted out 1993 Ford Taurus. That might just be on me though as I just didn’t find myself enamored with Pillman’s time on the gridiron. However, I do appreciate that it is important as his struggles as an undersized nose tackle mirrored that of an undersized pro wrestler. Brian was seemingly always fighting an uphill battle. Once we get to Brian’s gamble with grappling, I was in for the long-haul. I really enjoyed the stories about his time with Stu Hart’s Stampede Wrestling in Calgary (if you haven’t read it, I highly recommend Heath McCoy’s book, Pain & Passion) and his transition to WCW. Due to Brian’s size, he had to struggle the majority of his life to gain the acceptance of both the fans and his contemporaries. O’Rourke made me feel Pillman’s constant disappointment over his consistent stop/start pushes as a featured performer as well as trying to figure out what would get him to the next level. Seeing as half the book is devoted to the final two years of his life and career, it’s easy to see where the meat of the story lies. O’Rourke doesn’t disappoint diving deep into the blurring of the on-screen persona and the behind-the-scenes behavior of Pillman that made him the most must-see performer of the era. Pillman’s erratic character was both ahead of its time as well as something that could not possibly work today given that the average fan is much smarter to the business than ever before. The lengths Pillman would go to convince both the audience as well as the boys backstage that he was crazier than a shithouse rat were unprecedented. While he let a few select people believe they were all-in on his plan, you come to find out that no one was really given full access to Pillman’s grand vision. This allowed Pillman to accomplish things in wrestling that just didn’t seem possible in 1996. The “Loose Cannon” character was groundbreaking in that it would prove you could successfully blur the lines between reality and fiction allowing a brand new story-telling device to the world of pro wrestling. Pillman’s untimely death is covered with care spotlighting both the grief of those he left behind as well as the lingering influence Pillman would have on a new generation of performers. The outpouring of support from his peers is highlighted in the final pages by covering the four annual tribute shows that would follow in his passing where performers would work for free leaving all proceeds to fall to Pillman’s widow Melanie as well as his children. While the years that would follow would not treat Melanie nor Pillman’s family well, there is hope in that Brian’s son, Brian Pillman Jr, has enrolled in wrestling school with visions of following in his father’s footsteps. With Crazy Like a Fox, O’Rourke has written one of the best wrestling biographies I have ever read. I can’t recommend it enough.